Here you will journey to many delightful works of art and learn about some of these artists. Be sure to come visit Sammy, Cheyenne and Artica and see what kind of havoc they can wreak! Here you will find pictures of dad and his family. Relax and enjoy these java applets I have created! 2 heartfelt poems you can't miss. Photos of myself and my family. pack rings I belong to. with every breath they take! Thanks to everyone who has honored me with such gallant and enchanting awards. was created by Sam SilverHawk. This is a must see site! 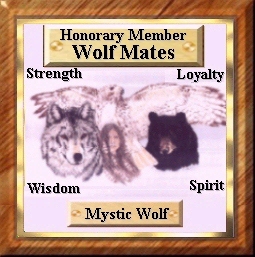 �Copyright 1998-1999, Kindred Spirits of Mystic Wolf. All Rights Reserved. the expressed written permission from the author.